The Pulsar and Apache range were very crucial offerings as they offered sporty riding dynamics and commute-friendly characteristics at an affordable price. In the new Pulsar 150 variant, Bajaj borrowed the Pulsar 180’s bodywork and added a rear disc brake as well. 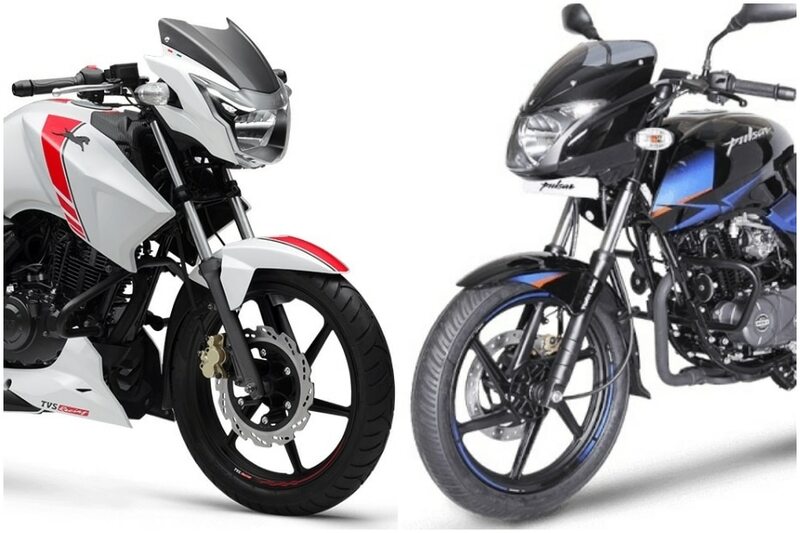 TVS, on the other hand, gave the ageing Apache RTR 160 a neat colour scheme and named it the Race Edition. The Hosur-based manufacturer offers the Race Edition in both rear drum and rear disc variant. To be fair, we have compared both the disc brake-equipped bikes against each other to find out which one makes for a better buy, at least on paper. The Bajaj Pulsar 150 Twin Disc edition looks similar to the Pulsar 180 as it shares the same bodywork. You get a split seat configuration instead of a single-piece seat that’s found in the standard Pulsar 150. There’s also a new colour scheme with matching rim stickers. The rear grab rail is of the split-type variety as opposed to the simpler-looking one in the standard variant. There are three colour options available - Black Blue, Black Red and Black Chrome. As expected from a Pulsar, the fuel tank is also generous, at 15 litres, and the instrumentation is a combination of analogue and digital units. The Apache RTR 160 Race Edition features a minimalistic, yet elegant white paint scheme with red racing stripes. The engine cowl features TVS Racing stickers and the rim stickers too have the TVS Racing logo on them. The Apache also uses an analogue-digital combo cluster, but the seat is a single-piece unit. While the Pulsar makes do with bulb-type pilot lamps, the Apache features LED DRLs flanking the halogen headlight. The Apache’s 12-litre fuel tank, however is relatively smaller. Apart from improving aesthetics, the tank cowl on the Apache RTR 160 Race Edition is functional too. TVS says it helps in reducing the engine heat by 10 degree celsius. On the other hand, Bajaj claims that the Pulsar 150 Twin Disc’s engine has a considerable improvement in noise, vibration and harshness levels. Fuel is fed via carburettor for both the motorcycles, and they also have a 5-speed transmission paired with their engines. The Bajaj Pulsar 150 Twin Disc edition gets a fatter 37mm front fork compared to the normal version and twin nitrox shock absorbers at the rear. At 1345mm, the wheelbase is also 25mm more. On the other hand, the Apache also rides on traditional telescopic forks up front and twin monotube inverted gas-charged shock absorbers at the rear. The Pulsar is built on a single downtube frame, while the Apache has a double cradle synchro-stiff frame co-developed with TVS Racing. This frame, coupled with its shorter 1300mm wheelbase and 7kg lesser weight should make it more agile in the city streets. The longer wheelbase of the Pulsar 150 Twin Disc coupled with its heavier weight should result in better stability on the highway. The Pulsar's 200mm rear disc brake is considerably larger than the Apache's 230mm unit. However, since the Apache uses petal discs, heat dissipation is faster resulting in braking consistency. Unfortunately, ABS is not present in either of the bikes, even as an option. Both the motorcycles roll on 90-section front but the Pulsar gets a 10mm wider rear rubber (120-section) than the Apache. Bajaj retails the Pulsar 150 Twin Disc edition at Rs 78,515, whereas the TVS Apache RTR 160 2V Race Edition will set you back by Rs 82,089 (both ex-showroom Delhi). While looks are subjective, the Apache not only seems lighter but also more powerful and agile on paper. If you’re looking for a no-nonsense affordable commuter with good riding dynamics, you’re better off with the Pulsar. However, if it's performance you are looking for, then the Apache for just Rs 3500 more, should be the one to opt for.